I have a quick little tip for you guys today! 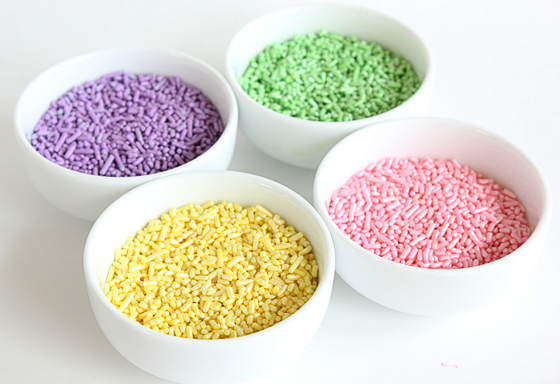 How to color you own sprinkles...yep just when you thought I couldn't get any more insane I take it to a whole new level ;) You see, I have a little secret. Ok it's really no secret...I love sprinkles. It's a slight obssesion. I am always on a hunt for new sprinkles and cupcake wrappers. 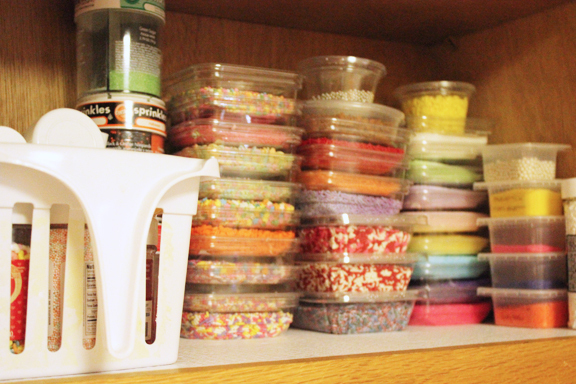 If you don't belive me here's a partial shot of my sprinkle cabinet, yes I have a whole cabinet dedicated to sprinkles. Which reminds me...I'm on a hunt to find an awesome way to organize these. I have had several ideas but nothing crazy good yet. So if you have one PLEASE share it with me, k? Anyways, back to coloring sprinkles. Even when you have loads of sprinkles it never seems to be enough. I always find myself looking for that particular color that just doesn't seem to exist in the universe. Or often I need it right now, and there's no time for online ordering. So one day I decided to color them on my own. Ok the hubs is right, I really can't leave anything alone. Ah, well. The best part about this is you can buy white sprinkles just about anywhere, Micheals, Wal-Mart, Joannes, even grocery stores. And they always seem to be in stock..most people don't use white spinkles a lot. 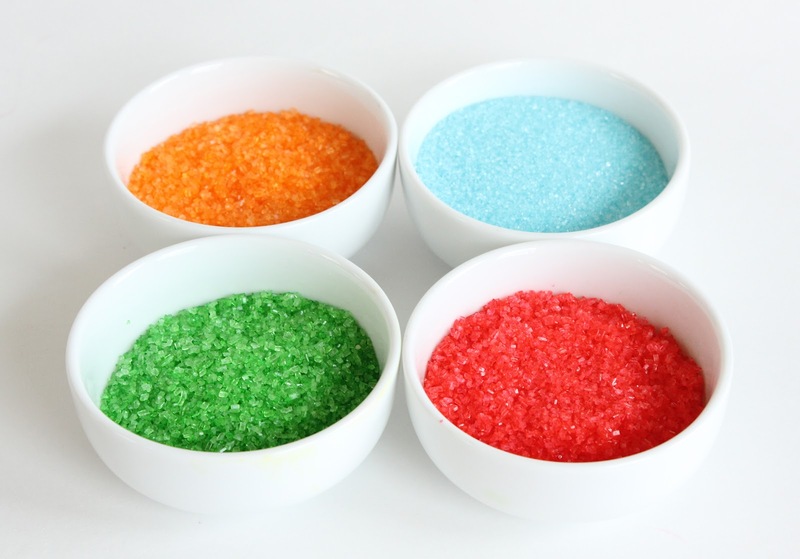 I do this with both sanding sugar and jimmies, and they both work great. 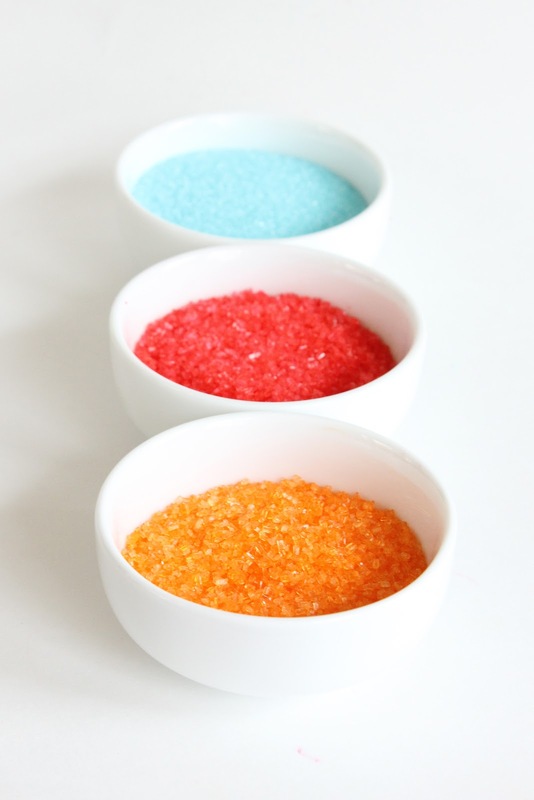 And, you can always buy a big thing of white in bulk and just color sprinkles as you need them, maybe then I could get rid of my sprinkle cabinet? Nah. 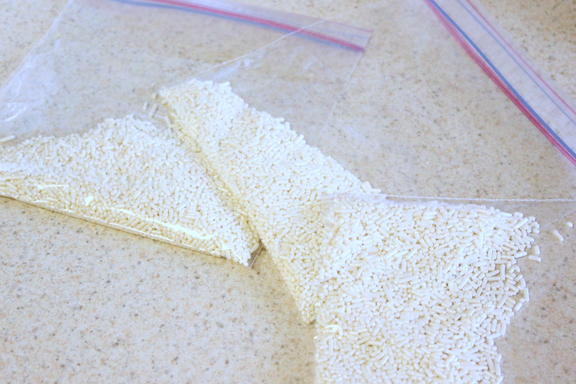 Here's what you will need: White sprinkles, gel coloring, ziploc bags, and toothpicks. 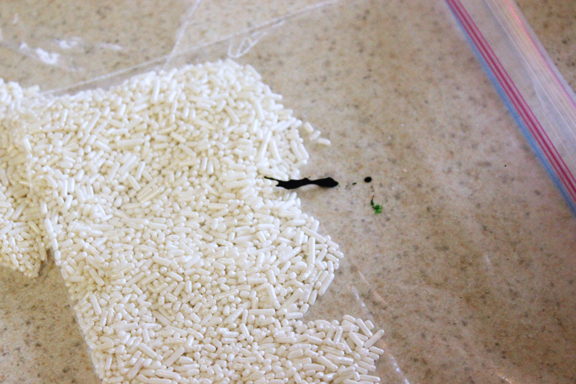 Step 1: Divide up you sprinkles into ziplock bags depending on how many colors your making. I made 3 colors of each and was able to make about 1/3 cup of each. 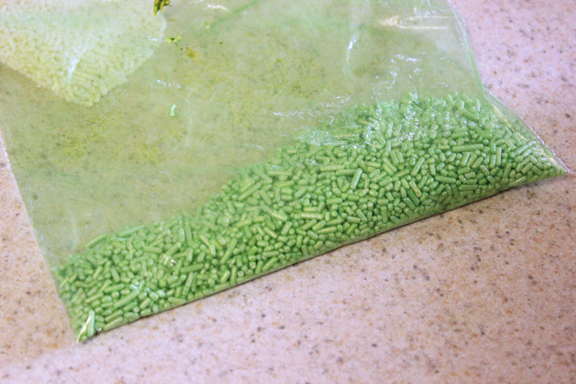 Step 3: Now close the ziplock and shake it up and rub it around between your fingers until the coloring is even. You can add more coloring to get a brighter color. Here I even added some yellow to brighten up my green. If the kiddos are around, let them do this...it's fun to watch them go from white to colored! Step 4: Once you've got the desired color just open the ziplock and let the sprinkles set for about 30 minutes, just to give them a little time to dry before bottling. 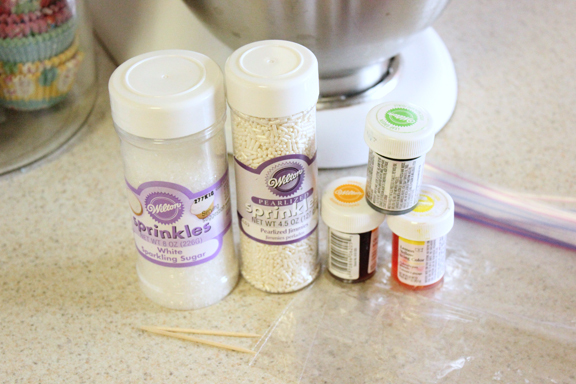 Now if your mixing the sprinkles you can mix them up and pour them right into the container they came. If your leaving them seperate you can leave them right in the same ziplock bag or find other small containers. Leftover baby food jars work great, as well as dollar store spice jars. 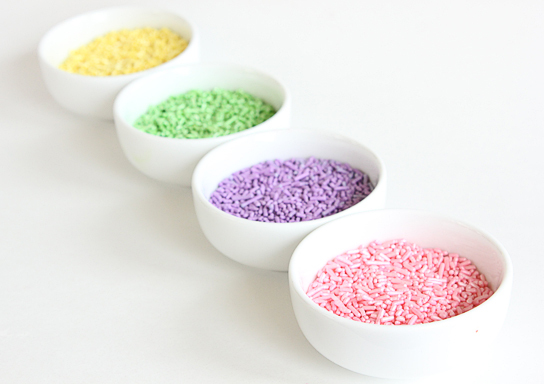 Now you can enjoy sprinkles in every color of the rainbow, for every party, season, and treat. Fun right? 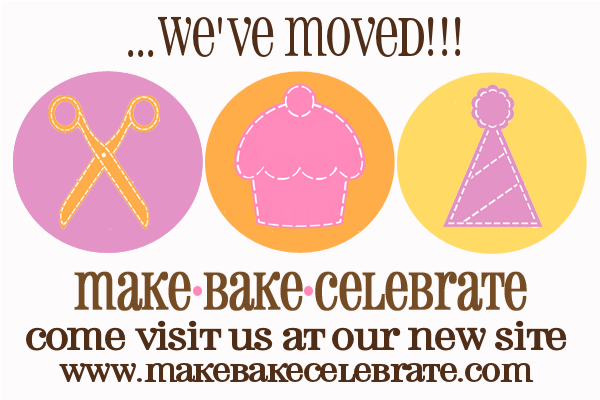 I've joined Celebration Shoppe's link party! Check out what everybody else is up too.